It’s taken me a long time to reach the point where I can cook and eat at least semi-seasonally. There have been a lot of years where I simply didn’t cook very often or not very creatively. In a way, I really regret that because I lived in places where fresh food is in abundance (Santa Cruz and Seattle) and I don’t think I took advantage of it. Now I live in a podunk rural town that only has a market for six weeks each year and I’m eating better, cooking more, than I have in years (perhaps because I’m actually happy). Last weekend, Artis and I went to the store and found fresh, ripe, local peaches on sale. Since we’d decided to do freezer preserving and the pectin had a peach preserves recipe on it, we bought a dozen peaches so we could make preserves and have peaches for breakfast. Unfortunately, we had to go buy more. After making preserves, we had three peaches left and my father was coming over for dinner. 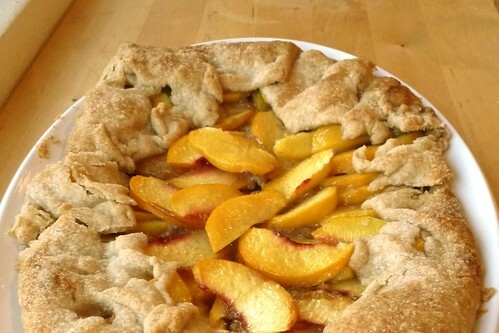 I made a taco salad with fresh salsa and guacamole, then decided on a fresh, free form peach galette for dessert. Ah, yes, now we come to the topic of today’s post. Galettes. 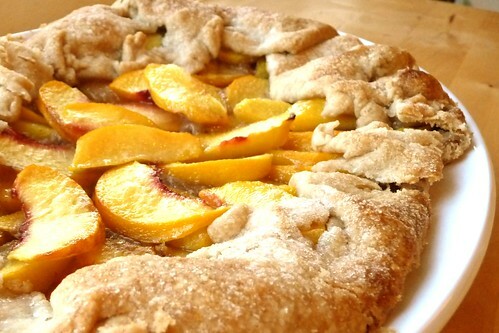 I’d made one before, but I didn’t like how it came out, so since I knew I had fantastic peaches, I knew I wanted a simple, simple recipe to showcase them. I found a likely contender at Smitten Kitchen, who takes photos that I can only dream of achieving one day. I made my own adjustments, as always, and the galette came out perfectly. Beautifully golden-brown, not too sweet, extremely flavorful thanks to the ripe peaches, with just enough dark undercurrent to make everything ‘pop’. I admit, I’m terrible at making circles out of dough; some days I do okay and others, like today, I manage a kind of oblong amoeba. But amoeba galettes taste as good as circle galettes, so don’t let rolling out dough stop you. Just make your own polygon. I’m not much of a baker or decorator, as I’ve mentioned in the past. The best part of the recipe was where she recommended putting preserves on top or vanilla ice cream, and I just so happened to have this leftover bit of peach preserves from the afternoon’s preserve-making, and just so happened to have a tart and tangy frozen yogurt I’d made the night before. Perfection. The only real problem is.. it’s gone. Supposedly it would serve 6 to 8 (mine was smaller), but… it served 3. None of us were able to resist having seconds. So, beware. You might find more on your plate than you expected. Combine all ingredients for the crust in a food processor. Pulse to blend until dough comes together in a ball. (You may need to add a tablespoon or two of ice water, go sparingly as it won’t take much to bring it together.) Flatten ball into a disc, wrap in plastic and chill for at least 30 minutes. On baking day: Let the disc soften so it can be rolled out. On a floured board, roll out into a large circle (or whatever polygon you can manage, like me) that’s about 1/8″ thick. Transfer to a baking sheet. Note: You really want a SHEET here, not a pan with raised sides. The sides make it bloody hard to remove when it’s done, so flip it over and use the underside. Just line it with some foil or parchment first so it doesn’t stick. Preheat oven to 400F. Stir together ground pecans, ap and spelt flour, one tbsp of sugar, clove and cinnamon in a small dish. Sprinkle this mixture over the rolled out dough, leaving a 1 1/2″ to 2″ thick border around the edges. Lay sliced peaches tightly in concentric rings, stopping at the edge of the sprinkled area. Sprinkle about 2/3rds of remaining sugar over the peaches. Fold the borders up and over, resting them atop the peaches. Pinch off or roll under any excess dough and watch out for tearing — the dough needs to be solid to keep the juices locked in. Brush the borders with melted butter and sprinkle with the remaining sugar. Bake for about 25 – 30 minutes until the crust is golden brown and the edges begin to caramelize. If you wish, sprinkle the chopped pecans over the galette about halfway through. When it’s done, slide it off the pan with a large spatula onto a cooling rack. Allow to cool for 20 minutes. Serve topped with a bit of preserves and vanilla ice cream or frozen yogurt. SK noted that this galette can be kept at room temp for 2 days (perhaps more) and longer in the fridge. Mine didn’t last an hour before it was gobbled up and I think that’s a greater “danger” than spoiling. The unbaked dough will keep in the freezer for a few weeks and for a few days in the fridge, if you need to make portions ahead. This entry was posted in dairy-free, Dessert, french, fruit, recipes, untranslated. Bookmark the permalink.